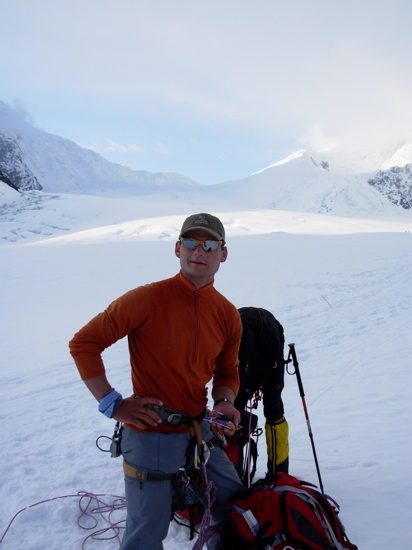 From Base Camp (7200'), we immediately lose elevation down the aptly named "Heartbreak Hill" to approximately 6800 feet on the main branch of the Kahiltna Glacier. 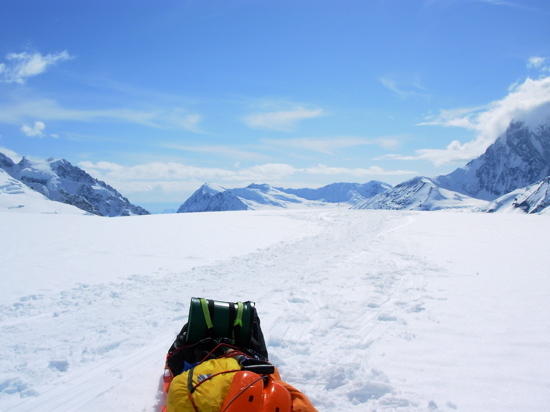 The "Lower Kahiltna", as it is called, is home to some of the largest crevasses on the mountain and the nature of the climbers' route through the maze of slots changes drastically throughout the course of the season. 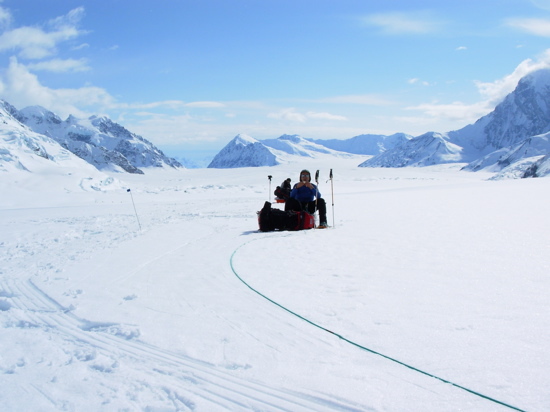 Even from the start to the end of your climb, cracks will open and paths will change, creating sometimes tedious navigation through the glacier. Crevasse falls are an annual occurance on this part of the route and climbers need to remain very alert and be prepared for a fall at any time. 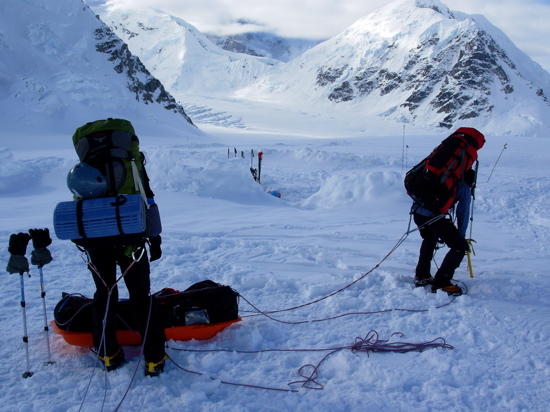 AAI teams practice group crevasse rescue on Denali, and most expeditions have three rope teams to assist in crevasse rescue if and when the need arises. 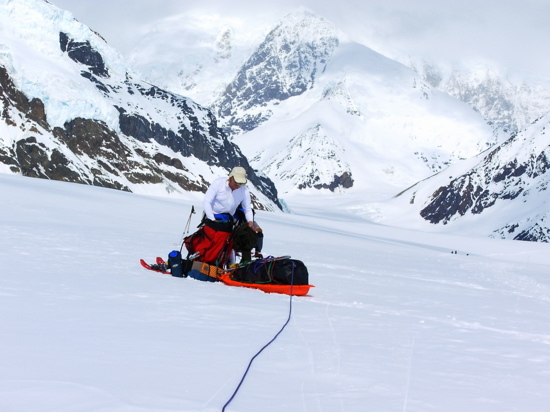 It is important to note that we have never had an incident where climbers or guides were injured or seriously harmed due to crevasse rescue scenarios. In fact, AAI teams have repeatedly come to the rescue of other parties in need of assistance on the mountain. 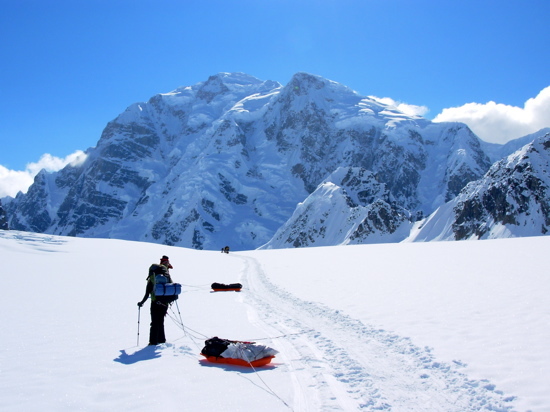 Many of our guides have received the honorable "Denali Pro Pin" award for their services and efforts on the mountain. 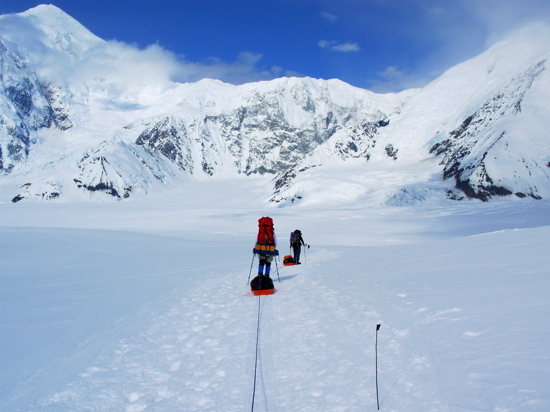 The route through the lower Kahiltna is fairly gradual, but as we approach Camp 1 at the base of Ski Hill we encounter a few gentle hills and gain a few hundred feet of elevation before desending just slightly into camp. 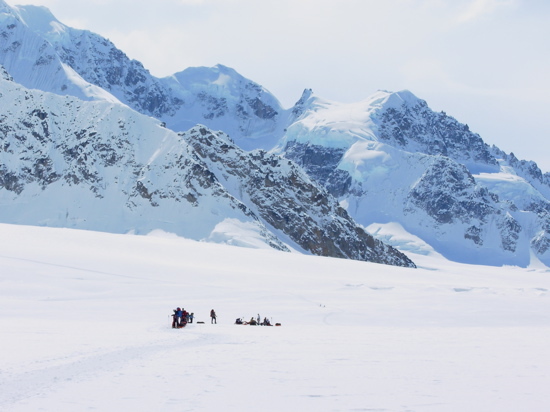 Most AAI groups make a single carry from Base Camp to Camp 1, and this is often one of the hardest days of the trip. 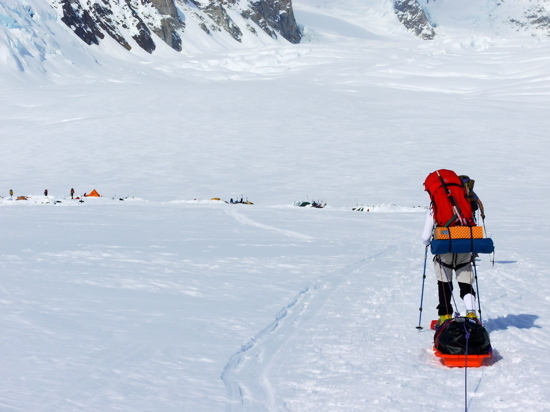 Making a single carry means that instead of traveling the climbing route between Base Camp and Camp 1 twice, you will travel with all of your gear and food in one day. 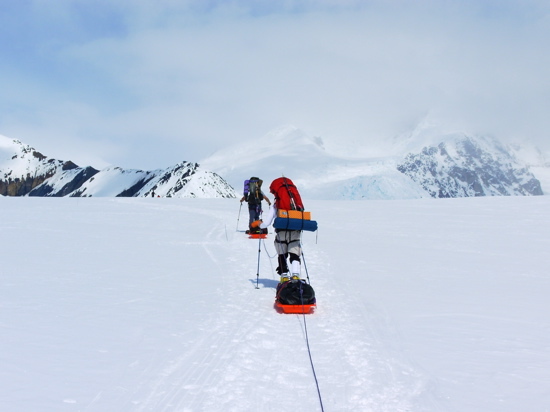 Climbers should expect to have 70 pound backpacks and to be pulling sleds that can weigh upwards of 80 pounds. 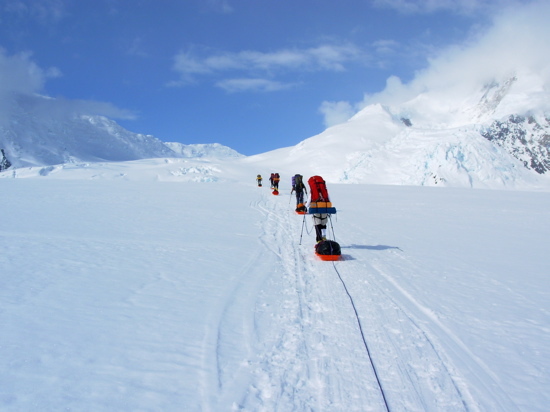 After mid-May, most teams opt for a night schedule on this portion of the route to avoid the heat of the day on the flat glacier. 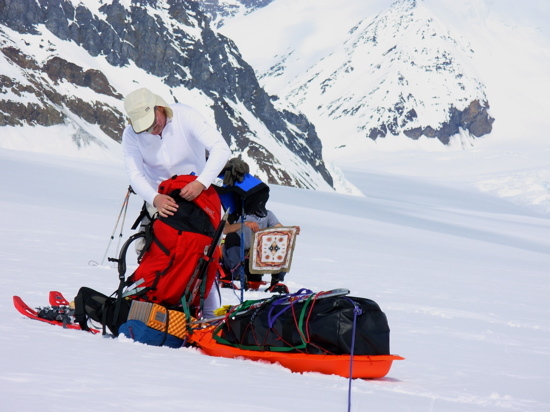 Packing up at Base Camp and preparing for the single carry to Camp 1. 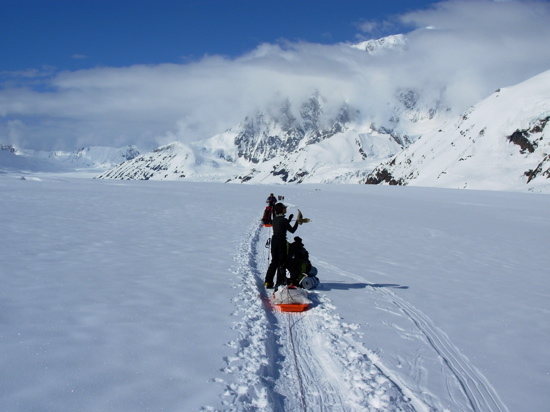 An AAI team starting down Heartbreak Hill towards the main branch of the Kahiltna Glacier. 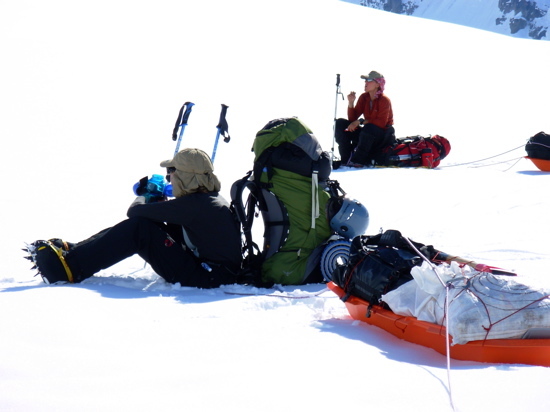 Teams stop for a break at the Base of Heartbreak hill as they gain the lower Kahiltna Glacier. AAI guide Matt Anderson takes a break and enjoys the early morning shade on the lower Kahiltna. AAI guide Matt Anderson fueling up for the long drag ahead. 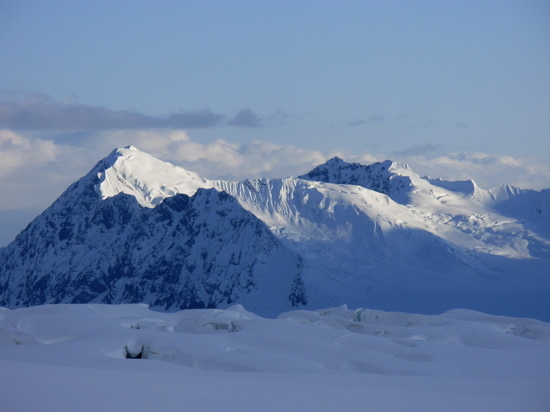 The early morning sun creeping down Mount Foraker towards the Kahiltna Glacier. A climber sheds layers as the heat of the day starts to overtake the Kahiltna. 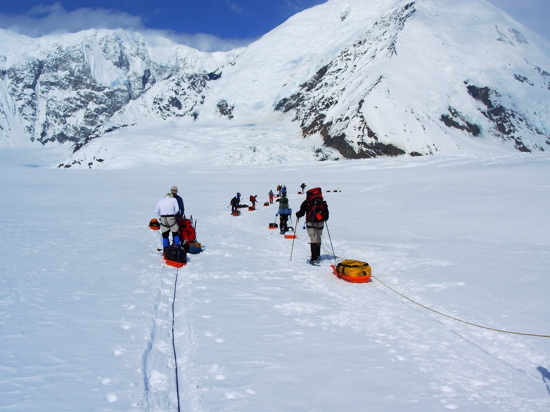 Rope teams travel along the two mile wide glacier on their way to Camp 1. 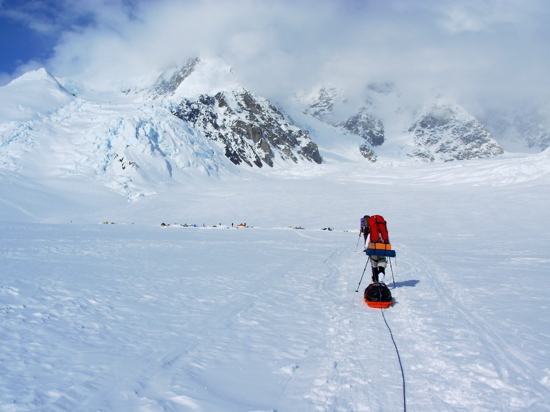 A climber battles with a mountain of gear on the lower Kahiltna. Ascending one of the gradual hills just before reaching Camp 1. Ski Hill is in the distance. 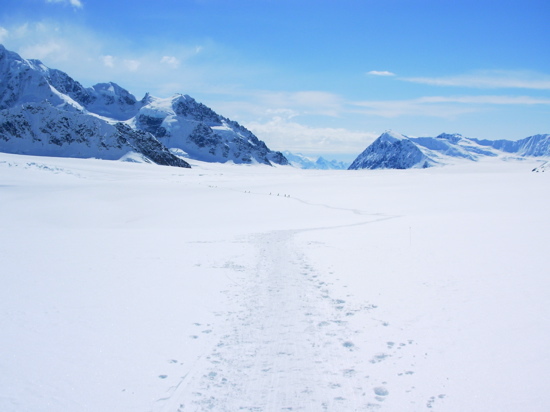 Looking back down the Kahiltna towards Base Camp. Note the rope teams at center. Climbers heading up Ski Hill just above Camp 1. Looking back down the Kahiltna just before Camp 1. Taking a break in the heat of the day on the way to Camp 1. 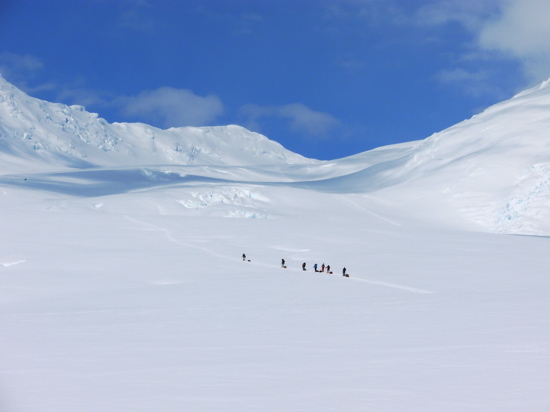 Approaching Camp 1 with Ski Hill in the distance and the Northeast Fork of the Kahiltna to the climbers' right. 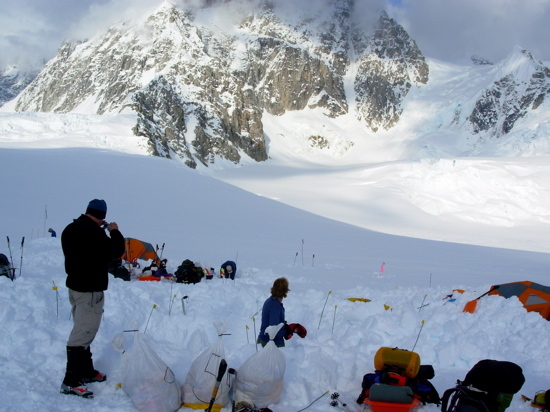 Rope teams just outside of Camp 1 with Ski Hill and Kahiltna Pass looming above. Camp 1 at 7800 feet just below Ski Hill. 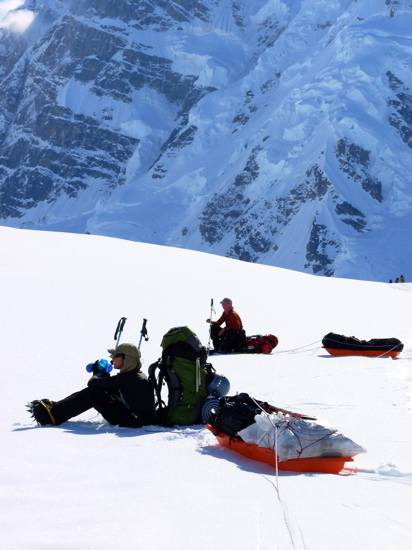 Climbers reaching Camp 1 after a long, hard, and hot day on the glacier. 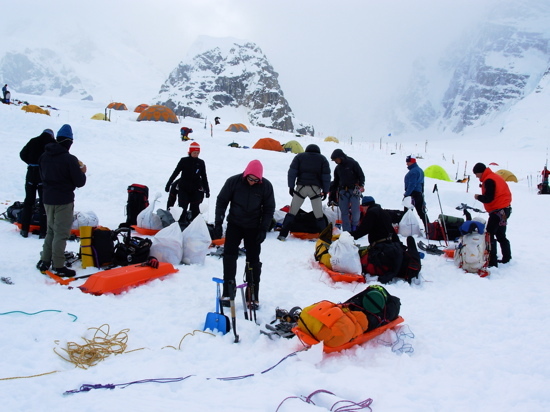 Climbers prepare to drop their loads after reaching camp. 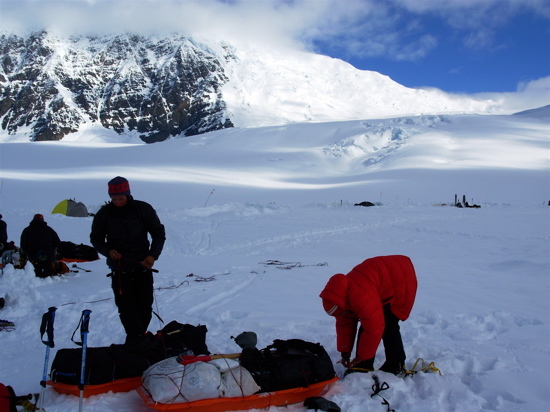 An AAI team sets up and digs in at Camp 1. 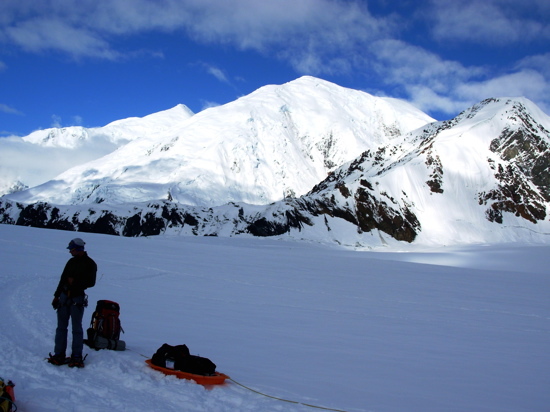 Looking back down the Kahiltna Glacier into an amphitheatre below Mount Foraker. Headed back up Heartbreak Hill with Mount Hunter in the distance. Taking a break on the way back up Heartbreak Hill. 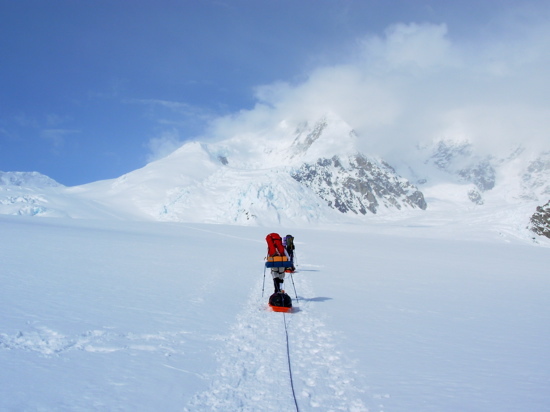 Mount Hunter looms above resting climbers just below Base Camp.